In this week’s roundup we take a break from BTC price commentary to talk about its first fork, Litecoin, which is expected to give birth to its own fork this week. 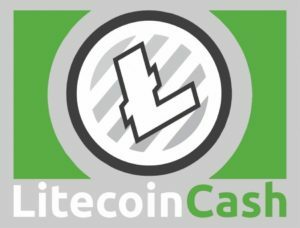 We tell you everything you need to know about Litecoin Cash, how its different from other coins, how to get it, and what precautions to bear in mind before you do. We review what the petro coin is, why you’ll probably want to stay away from it, and also examine the social media significance of Ethereum developer Vitalik Buterin, who by the age of 24 has become one of the most idolized, imitated and attacked figures of international recognition. It was a great week for the first two cryptocurrencies as bitcoin and litecoin both ended with 20%+ gains. Investor panic seems to have ended as the price of BTC swelled above the $10k mark for the first time this month, propelling most other coins with it. Litecoin (LTC), which had been in something of a slump this year, found new life thanks to a flurry of new developments that were announced earlier this week. Among such developments are plans for a Litecoin fork which would give holders 10 new coins for every 1 LTC, and a payment acceptance deal with Visa to make it easier for easy conversion of funds. The fork is set to take place this morning (Monday, February 19th). The resulting product, Litecoin Cash, sports 2.5 minute confirmation times and a reduced fee structure aimed at incentivizing real-world use. Not everybody is happy with the new fork. 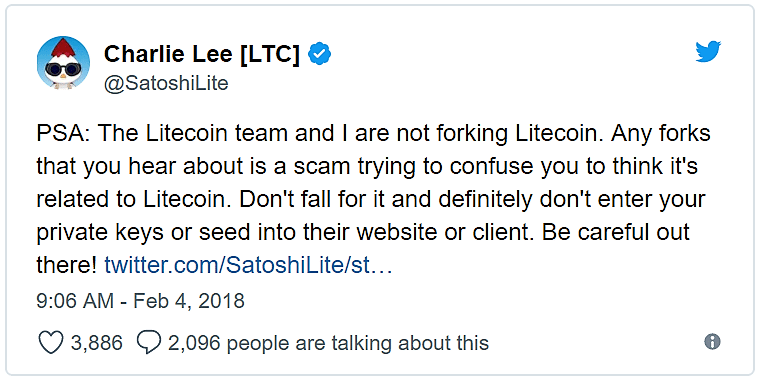 Litecoin founder Charlie Lee stated he thought the maneuver by a team independent from the Litecoin project was likely to be a scam and advised Litecoin users not to give up private keys for their stashes to an unknown, potentially devious third party. The Litecoin Cash team is largely anonymous and is said to be hiding behind a larger front known as the Litecoin Cash foundation. Those looking to cash in on the redemption process are cautioned to practice “safe forking,” which involves moving coin stashes to different addresses after the fork before revealing the private keys of the pre-fork address to a Litecoin Cash wallet or client. It may take a few days for a client-side wallet to be properly vetted by the crypto community but not losing your coins during scam setups may make it worth the wait. Fork seekers are also reminded to never give out their private keys to any sort of entity and that they are for the sole use of recovering the contents of a wallet. Long a topic of international interest since the announcement of its development, the oil-backed petro cryptocurrency approved by Venezuelan president Nicolas Maduro is being released to the public on Tuesday. 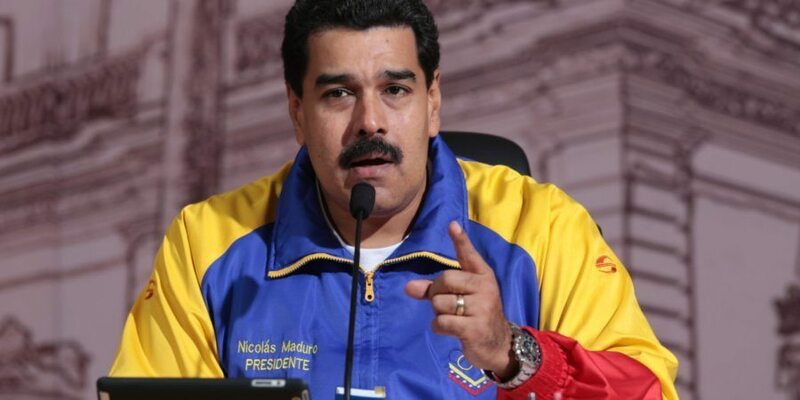 Maduro moved forward with plans to raise hard funds by selling the cryptocurrency against the will of the country’s opposition-backed congress, who declared the petro “illegal” as it is considered an unapproved form of government borrowing. A single buyer snatched up a whopping 96,000 bitcoins in a time span of less than two weeks, paying an average price of just under $9,000 a coin. The anonymous buyer, which could just as easily be an institutional fund as an individual person, is already sitting on a massive profit of close to $100 million at today’s prices. The purchases were made using Coinbase and are among the biggest by dollar amount ever recorded in a single transaction, perhaps lending credence to the idea that the rising popularity of bitcoin is not slowing down. Vitalik Buterin, founder of the wildly successful, second-gen crypto Ethereum (ETH), now has a distinction that will never be claimed by the likes of Satoshi Nakamoto: he is the target of hundreds of impersonation attempts on social media every day. Impersonators on Twitter and Facebook usually only clone accounts of famous celebrities and media personalities, looking to trick viewers into sending them money in support of fictitious causes. The stampede created by social media over the lucrative prospects of cryptocurrency has propelled the mild-mannered programmer to superstar status, with a combined platform following of over one million users. Buterin was on record this week stating his preference for traditional assets over cryptocurrency when it came to the matter of long-term investments. Citing high levels of volatility, uncertainty and shifting trends in popularity, the crypto magnate warned that cryptocurrencies “could drop to zero” with little warning, if they were to become outdated or fall victim to a bug exploit. Buterin is an advisor of the MakerDAO project (MKR), which just completed launch of its $45-million “stable fund” for a dollar-pegged Ethereum token known as Dai. Although Buterin is a proponent of stability in cryptocurrency, his stance on hard fork “bailouts” – blockchain rollbacks initiated to undo the work of a saboteur – is being widely criticized by Bitcoin Core developer Greg Maxwell, who accuses the Ethereum founder of having too much power over the fate of crypto fortunes. Add organic grocers to the list of professions whose economy is being revamped by the blockchain. An article published by Forbes last week outlines the ways in which organic food supplies can be measured up to a “farm-to-table” standard using the blockchain. Through providing information about a product and its quality as recorded on a secured blockchain, both suppliers and consumers have a way to validate claims made by producers regarding worker labor practices, supply chain transparency and avoidance of GMOs. The adoption of “smart tag” technology to validate the authenticity of a product has already proven popular in the fashion industry where counterfeiting is a $600 billion-dollar industry.